I’m sure all of us have had this happen before. You stroll around through the UI of your favorite software package and find a button that somehow you have missed seeing before. I have never claimed to know everything there is to know about SolidWorks, but I do know my way around a bit. 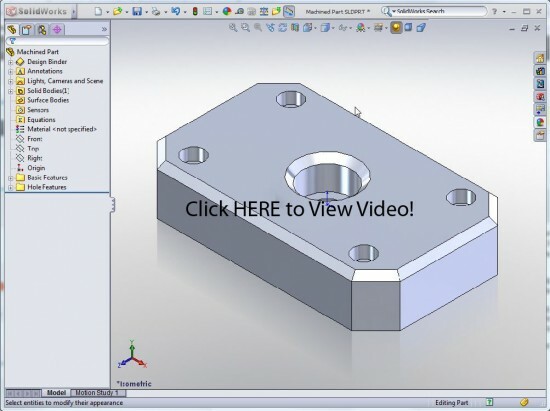 After serving as Technical Editor for three books on SolidWorks, I somehow have overlooked this little viewing tool, so I thought I would share it. The viewing tool I’m talking about is the Roll View option. It is available in the Right Mouse button menu in the graphics area. It allows you to roll the model about an axis pointing normal to the viewing plane. (The axis is coming out of your screen.) Here’s a short video showing it off. Alright folks, fess up! If you have never noticed this viewing tool before, leave me a comment. I’ll bet I’m not the only one! I’ve got some other stuff in the works and will be picking up a USB microphone this week so I can start posting videos with voice again to the site. 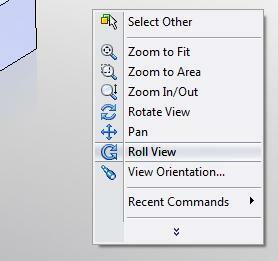 My next “series” of posts will be about SolidWorks Routing. This is something I have wanted to do for the site for quite some time and I’m looking forward to sharing some tips with you that will hopefully simplify the mystique that seems to surround that product at times. SolidWorks 2010 Beta testing is going well. As soon as the NDA is lifted I’ll have some videos ready to roll out that show off the new functionality. Never noticed the option in the right-click menu, but I knew this was available by ALT-holding down whatever button on the mouse you use for rotating (here it's pressing the scrollwheel). Works very nice in conjunction with the CTRL-click panning and SHIFT-click zooming. I have known the command was there, just never clicked on it or looked it up in the help file to see what it did. Will try it out today to see if helps out in rotating the model for making selections. Looking forward to the post on Routing. We had the UI manager from SW in at the last SWUG meeting and he went over that with us before the meeting an did a presentation on it at the meeting. Hmmm…I never have really paid attention to the command in the menus; I have always just used the Alt-[L or R] Arrows or Alt-MMB to rotate the view parallel to the screen. Ricky, what does roll view do in the drawing? It shows up in the right click menu, but doesn't seem to change the view. Nice post Ricky. I too have seen it there many times but never clicked on it. Gonna have to try it soon. I've not used that function either, though something similar is on my 3D mouse which I do use from time to time. It seems to be a good viewing tool. but i have never seen it before. thanks for the information, i will try this tool. good job….. I have used roll, but didn’t understand how to constrain the roll to 90 degrees. Finally discovered what Brian commented about: Rather than use Roll with the middle mouse button, select Rotate, then hold Alt and press the L or R arrow keys. This rolls the view in 15 degree increments. I collected some thoughts about Drawing Views. We look at what drives the scale of a view, how to change a style of screen views, and discuss the difference between the projection of the first and third angle.